The Best Macaron blogs from thousands of top Macaron blogs in our index using search and social metrics. Data will be refreshed once a week. Macaron newsletter is a comprehensive summary of the day's most important blog posts and news articles from the best Macaron websites on the web, and delivered to your email inbox each morning. To subscribe, simply provide us with your email address. San Francisco, CA About Blog come discuss/critique/post pictures/commiserate about the toughest cookies to bake, ever. Facebook fans 1,139,627. Twitter followers 501,848. Vancouver About Blog Indulge With Mimi is a blog all about baking macarons. Explains the proper macaronage techniques, how to use your oven, avoid hollow macarons and more. Facebook fans 1,054. Twitter followers 288. Miami, FL About Blog [ma-ka-rohn] Miami Macaron Online Store are striving to bring macarons into their full glory and share our passion with America. Facebook fans 10,357. Twitter followers 372. Montréal About Blog Located in Montreal, Point G is a specialist in gourmet products recognized for the quality of its macarons on the North American market. Facebook fans 11,185. Twitter followers 3,102. 24 rue des Moines, Paris 17 About Blog Acide Macaron is a pastry brand created in 2009 by a passionate couple, Renata and Jonathan Blot. The creative pastry chef, Jonathan Blot works on materials and redraws the offer without appearing to touch it. Acide renews the contemporary values ​​of pleasure. Facebook fans 9,777. Twitter followers 808. About Blog I'm Anthony, co-founder of pastreez. I'm crazy about macarons for a very long time. But my soulmate is allergic to dairy products. Follow this blog for gluten-free & organic macarons. About Blog Vincent Guiheneuf is a classically trained French chef, who has worked in fine dining restaurants in St. Tropez and Courchevel, France; Sydney, Australia; and more recently, Dublin, Ireland. Vincent’s experience and passion for food and teaching lead him to create, My French Chef. Utah, USA About Blog The Blonde who Bakes is located in Spanish Fork, Utah. It specialises in French Macarons, Painted Sugar Cookies, Cakes and other sweet treats. Facebook fans 1,103. Twitter followers 4. About Blog Here you will find all of my baking secrets, decorting tips, and answers to all of your sweet questions. Facebook fans 21,373. Twitter followers n/a. Hong Kong About Blog Love Macaroons is all aout home-baked macarons. Facebook fans 14,993. Twitter followers n/a. San Francisco & Palo Alto About Blog Chantal Guillon is above all a novel interpretation of the macaron, conceived as a unique, original, surprising creation. The selection includes both classic flavors and limited-edition macarons to be discovered according to the seasons and for special events. All created locally in San Francisco by a dedicated French and American team. Facebook fans 4,007. Twitter followers 206. Malaysia About Blog Caramel Factory is a baking school and patisserie located at Shah Alam, Selangor. Caramel Factory has all sorts of recipes, pictures and videos of my adventures in baking! I've always liked baking, mostly Japanese-style pastries and breads. Facebook fans 2,392. Twitter followers 1. New York About Blog The French Macaron Critic is chronicling her journey to find and taste magnificent French macarons, help others to find their perfect one and support local businesses. Facebook fans 79. Twitter followers 265. About Blog Baking traditional Macarons with Angel Bake products is amazingly simple. Follow this blog for French Macaron Recipes with Buttercram Filling. 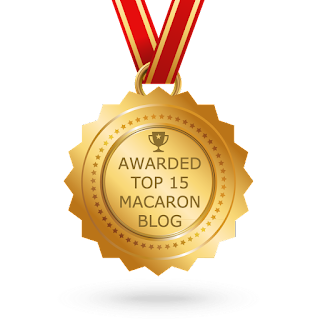 CONGRATULATIONS to every blogger that has made this Top Macaron Blogs list! This is the most comprehensive list of best Macaron blogs on the internet and I’m honoured to have you as part of this! I personally give you a high-five and want to thank you for your contribution to this world.